The exclamation marks will only show when you “preview” the PO in your Purchase Order Work Area. We do this in case someone gets their hands on it, so they know it’s not an official order yet. Some form layouts also include something like “Draft copy – do not process” somewhere on the form. When you process the Purchase Order and print an official copy and/or e-mail the PO to your supplier, it will not have the exclamation marks. …or you can select to “process now” when prompted upon exiting your PO Work Area. Imran works in the Engineering Services field and was asking about the best way to create PDF files of his Purchase Orders to send to his suppliers when using the free version of SpendMap. “While processing a PO, how do I print the buyer’s copy and seller’s copy separately? Imran is printing both a “supplier’s copy” as well as an “internal copy” of his Purchase Orders, and both are ending up in a single PDF file (since both copies are in the same print job). This would also be an issue when processing multiple POs for multiple suppliers at the same time. For example, if you processed 5 POs in your PO Work Area for 5 separate suppliers, if you chose to print to a PDF file, you would get a single PDF file containing all 5 orders, again, since all are coming from the same print job. If you’re printing hard copies (on paper), this doesn’t matter because you’ll just grab the pile of POs off the printer and give each one to the applicable supplier. But if you’re printing to PDF (most likely to send to your suppliers by e-mail as Imran is trying to do), then you will end up with a single PDF with all POs in a single file, which obviously won’t work. Solution: Use SpendMap’s Email Module to send the supplier their PDF file. Instead of enabling multiple copies of your printed POs in PO Printing Settings, just use SpendMap’s built-in email feature to send the supplier their copy of the order. When you process new orders, SpendMap will create a PDF copy of the PO, attach it to an e-mail message, and will send it to the supplier automatically, with no manual intervention (i.e. it all happens behind-the-scenes, so there is no need to manually create PDF files, manually create e-mail messages, and then attach the applicable PDFs to the applicable e-mails. You actually have both options. The e-mail can come from the individual Buyers (i.e. the person who processes the Purchase Order in SpendMap) or it can be the same e-mail address regardless of who is sending the order, such as “Purchasing@YourCompany” or similar. Per the Online Help for that setting, the “sender” is noteworthy as the recipient might reply to a message or an error might occur during transmission (in which case the sender would typically get an “undeliverable mail” message from the outgoing mail server), so if you decide to use a single e-mail address for all messages, make sure that someone is set up to receive messages to that account. Randy is referring to Purchase Orders in the users’ PO Work Areas, which contain their “work in progress” (i.e. the POs that are still “on their desks”). When they’re finished, they will process the new POs, which will update many areas of the system, so that everyone can see (provided they have the appropriate permissions). So yes, Purchase Orders, Requisitions, RFQs and other “pending” documents/transactions will not be visible (in most areas of the system) until they are processed. Sometimes you may need to force a “page break” while entering a PO or other document in the free version of SpendMap. For example, some people like to add instructions for the supplier or other special notes/comments on a separate page. Or maybe you want a separate page for each Ship-To location, with a separate list of items for each destination.. TIP: If you ever need to move line items from one page of the document to another, please note that the [Copy/Cut] button at the bottom of the Line Item Summary Screen works across pages. That is, you can Cut one or more line items from one page and then Add or Insert them on a different page (or even a different PO). As if you needed even more motivation to implement our Free Purchase Order Software. We added a new feature in the 2014 Release to convert approved Purchase Requisitions into Purchase Orders, as soon as the last approval occurs, so you no longer have to run the Build PO Utility as a separate step. We had a few requests for this feature from smaller companies that don’t have Purchasing Departments or dedicated Buyers (i.e. the Requisitioners are responsible for placing the orders once their Requisitions are approved). The Tutorial also reviews a few other related features that are popular with smaller companies (and larger companies that have “end-user Purchasing”), so we rolled it all into this video, which we’re calling “Simple Requisition-to-PO Processing”. As it turns out, we recently added support for PDF file creation in that area, so if you’d like to save new POs to disk rather than printing a hard copy, that option is now available. If you’re still getting the message “PDF file creation is not available from here”, just select the menu HELP > CHECK FOR UPDATES to update your free version of SpendMap. That way, you won’t have to manually create an e-mail for each PO, manually attach the PDF file that you created, etc. In addition, if you process a batch of POs for multiple suppliers, SpendMap will automatically create a separate e-mail for each supplier, and attach only their POs. By comparison, if you use the “Disk (PDF) file” option when processing new POs, you’ll get a single PDF file with all POs that you’re processing (for all suppliers), so you’d have to process the batch in pieces in order to get a separate PDF file for each supplier. Don’t need a copy of your Purchase Orders at all? Some of you might be printing to disk because you don’t need any hard copies at all (e.g. if you’re calling in your orders to your suppliers), so perhaps you’re using the “Disk (PDF) file” option to avoid sending the print job to your printer? If so, please consider using the “None/verbal” option in the Send Document Via field, in which case new POs will not be printed or transmitted when processed. Again, you can use this option when you only want to store the PO in the system, but you have another means of informing the supplier about the new order (e.g. by phone). Got anymore feedback for us? We’re not exactly sure why a few of you have asked for the ability to (manually) save a copy of each new PO to disk, but we try to listen so, again, we did add that ability recently. If you still want to, you can now select the “Disk (PDF) file” option when processing new Purchase Orders from your PO Work Area. >>> 07/29/2015 update – The free version of SpendMap now includes a free, built-in e-mail service, which you can use instead of configuring the system to use your own e-mail server or ISP. This post has details. The balance of this post, below, still applies if you want to set the system up to use your own e-mail server or ISP. 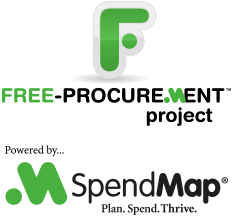 Most people who use the Free Version of SpendMap want to send Purchase Orders and other documents to their suppliers by e-mail. You can also enable various e-mail notifications, to let people know about important events, without them having to log into the system (e.g. “You have a new Requisition waiting for your approval” or “Your Requisition was rejected”, and so on). For SpendMap to send e-mail to your suppliers and staff, you need to enable and set up the e-mail connectivity module, which is included in your free PO software. Most people use the SMTP protocol (as opposed to MAPI), so I’ll assume SMTP for now. If you have any questions, or if you prefer to use MAPI and need any tips after reading the Online Help, please log a free support ticket. >>>CORRECTION<<< After we posted this article, we realized that the MAPI option might be better than SMTP for many smaller companies (the target market for the Free-Procurement Project). If you have any trouble using the SMTP option outlined below, you might want to give MAPI a try instead. Here’s another post with more details. On the E-mail Settings screen, select “ISP or SMTP server” in the two fields at the top of the screen. Then, in the block of fields labeled “SMTP” just below that, enter your outgoing mail server’s name or IP address. It will usually look something like “smtp.service-provider.com”. Again, you can probably get that from the Settings area of your e-mail software, or you might have to contact your service provider or IT Department. Next, enter “587” for the port number, unless your service provider advises you otherwise. Then enter the user account (or e-mail address) that you use to log into to your e-mail account, and the associated password in the adjacent field. That’s usually all that is needed for SpendMap to connect to your outgoing mail server. Other than that, you will need to fill in the three fields at the bottom of the screen (Proper User Name, User E-mail Address, and SpendMap User ID). This will improve the formatting of the e-mail messages that your suppliers receive. Again, the Online Help has details of what those fields are used for. So those are the only mandatory (i.e. minimum) fields that you have to fill in. You may, however, want to review the other (optional) fields. For example, if you want to add some text to the cover page of the e-mail that goes along with each new Purchase Order to your suppliers, you can use the Boilerplate field in the center of the screen. If so, this blog post may also be of interest. And it’s also quite popular to enable the setting to “Maintain a log of sent e-mail messages” but, again, all that stuff is optional. And again, the Online Help has all the details. Once the E-mail Settings are configured per above, it’s time to test that SpendMap is in fact able to connect to your outgoing e-mail server. Rather than processing a new PO to do this test, I prefer to just try e-mailing a report, which has less variables than processing a PO, so it’s faster/easier to confirm that it’s working. So, assuming the report shows up in your e-mail client, then that means that SpendMap is able to send e-mail. Once you have the e-mail feature working per above, you can enable the various types of e-mail messages in SpendMap. Are you sending Purchase Orders to your suppliers using the e-mail feature in the free version of SpendMap? If your e-mailed POs are getting caught in your suppliers’ Junk Mail filters, you might want to try adding some text to the e-mail cover page. Without some content in the body of the e-mail, the e-mail will include only an attachment (the attached PO) and one line of text (the default e-mail footer “Get your FREE Purchasing Software at…”, which also includes a hyperlink). In some cases, a one-line e-mail with a hyperlink and an attachment will be enough to trigger a supplier’s SPAM filter. Please process the following orders/confirmations. If you have any questions, please contact us before processing this order. Also please add this e-mail address to your “safe sender” list or address book, to help ensure that you get our Purchase Orders going forward.